My efforts to track the poet Henry Reed through his early decades of the 1930s and 40s are often frustrated by the constant manifestations of another semi-famous "Henry Reed": a popular British band leader who seems to have made nearly daily appearances on the radio during that time. This doppelgänger's career only begins to fade out in the mid- to late-1940s, just as our poet's begins to rise. It was probably owing to the overwhelming multitude of the Pretender's radio appearances which led me to overlook this article from the Manchester Guardian, in September, 1937: a first-person report—narrative, really—from the annual Piedigrotta music festival in Naples. For a brief moment I feared it had been written by the musician, but before I even finished the first paragraph I realized it must be the Literary Reed: the ghost of Leopardi materializes; a paraphrase of Baedeker's Italy is inserted; there is a struggle with Italian dialect; Pompeii; and lastly—the clincher—there is a repetition of "to-morrow. To-morrow. To-morrow...". The Piazza di Piedigrotta in Naples is never properly to be called quiet, except occasionally between two and four in the morning. In the first week of September, while people are restlessly waiting for the Popular Song Festival, even this intermission is ignored. On the night of the festival itself one is not especially conscious of enormous noise, for it seems by this time that one has never known silence. Not far away from the radiant tunnel of lights in which the musical competitions take place Virgil lies in his mythical tomb, and in another direction, Leopardi lies in his real one. Do they ever turn in them on this night, one wonders? The festa once had a ceremony, a ritualistic splendour, but it is not to be supposed that its participants today know that, or bother much about it, though they are happily conscious that their revels are tolerantly presided over by Santa Maria di Piedigrotta in the near-by church. The cook at the pizzeria has never heard of Charles III. The old man who even at this time tries to sell you bootlaces cares nothing for Charles's victory at Velletri in 1744. The tenor who sings the new songs might perhaps be interested to hear that Charles commemorated Velletri by instituting the festival at which he earns whatever he eats instead of bread and butter, but more probably he would merely smile and murmur during the introduction of the second verse that it would have happened anyway. And the information that "this huge fair was held every year with considerable magnificence till the fall of the Bourbon dynasty in 1859" would be greeted with huge derision. Considerable magnificence? Has not M------, the singer, introduced a perfectly splendid and gratuitous high D into the song of the year, a note it was thought would not be heard from a man in our lifetime? Are not the fireworks louder and brighter and longer and cheaper than ever before? Have not more new combinations of instruments been evolved this year than it was ever believed possible? Did you ever think to hear a trumpet and harp duet before? Magnificence? Every one of us has a Chinese lantern or an impossible nose or a paper hat. We all have those things that you blow out in other people's faces, or those things that you shake round in other people's ears. If you have unlimited money there is unlimited food. Over certain gelaterie there are still old-fashioned flaming gas-jets, but their noise cannot be separately heard as we feverishly lick huge slabs of ice-cream under them. For three singers are I passing in a cart, accompanied by a string octet. To me the words are unintelligible, though I am glad to hear the dialect word "Scetà," which comes in every Neapolitan song, I should think, and means "Wake up." I am deeply impressed and unnecessarily give the waiter a tip. As we hurry away I am severely rebuked for this extravagance by young Neapolitan friends. Arguing furiously, we all step with care over a happily sleeping tramp. I explain that I am not entirely penniless and that it is a season if not of peace on earth at least of goodwill to men. This is considered a silly remark, and after another debate shouted over the noise of bagpipes (bagpipes!) we go on. But the youngest of our party has disappeared. He comes panting up three minutes later, having, by what miracle of cajolery or menace I cannot find out, recovered my penny from the waiter. He gives it to his eldest brother to keep for me. The tunnel cut through the hill of Posilipo is brightly lit, and one can dance in it, since no automobile will be allowed to pass through it until to-morrow. The wise will have, learned the words and tunes of the songs from the leaflets that have been going about for the last few weeks. Anyone would have taught you the tunes on the violin or the guitar (there is, it appears, no piano in Naples). Then you can join in when the carts containing their little bands come round to catch your approbation. One must, of course, discriminate with care. The song of the year may be one of those that will not just circle the bay and die after a short excursion to Rome. It may be another "Funiculi, funicula," and go round the world for years and years. But even if nothing historic emerges the individual conscience need not worry. For it will all be a good racket while it lasts. The night will grow louder and louder, and we shall meet more and more new people, who Will remember you because you are English and odd, though you cut them to-morrow. To-morrow. To-morrow everyone is a bit hoarse. The lights are kept up the next night, for there is a natural attempt to make a good party last as long as it can. But it is rather a hopeless one, and the piazza next day has rather the aspect of an untalking film. In the reaction from the unspeakable recklessness that has led you the night before to embark upon ices, melons of all kinds, lemonade, several "veri vini," and great late figs you have become cowardly, and sit with your companions under the tawny lights of the fountain chewing monkey-nuts. 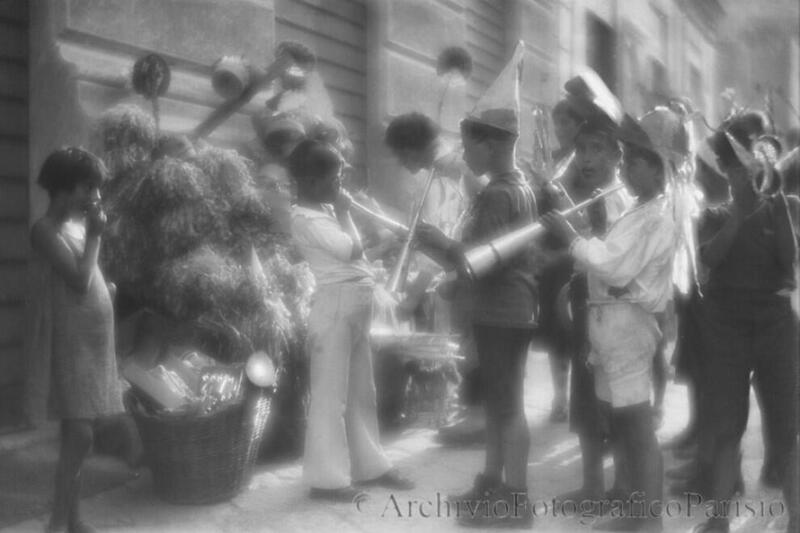 They have forgotten the festa and are reverting to a game of more permanent exhilaration, that of trying to teach you to say "Vedi Napoli e poi muori" in the dialect. "Vega Nabul' u puo' muo'" it sounds like. The last two words are especially hard, and you create much amusement by them.